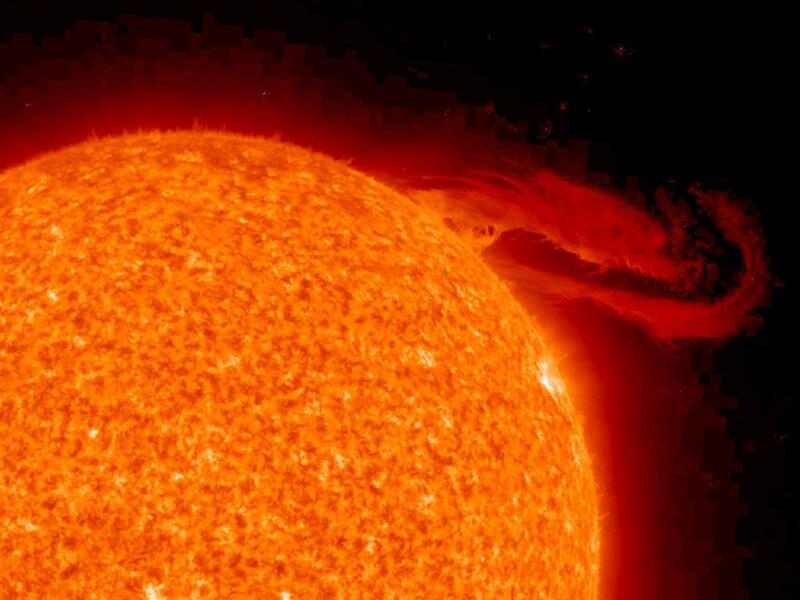 The STEREO (Ahead) spacecraft observed this visually stunning prominence eruption on Sept. 29, 2008, in the 304 angstrom wavelength of extreme UV light. 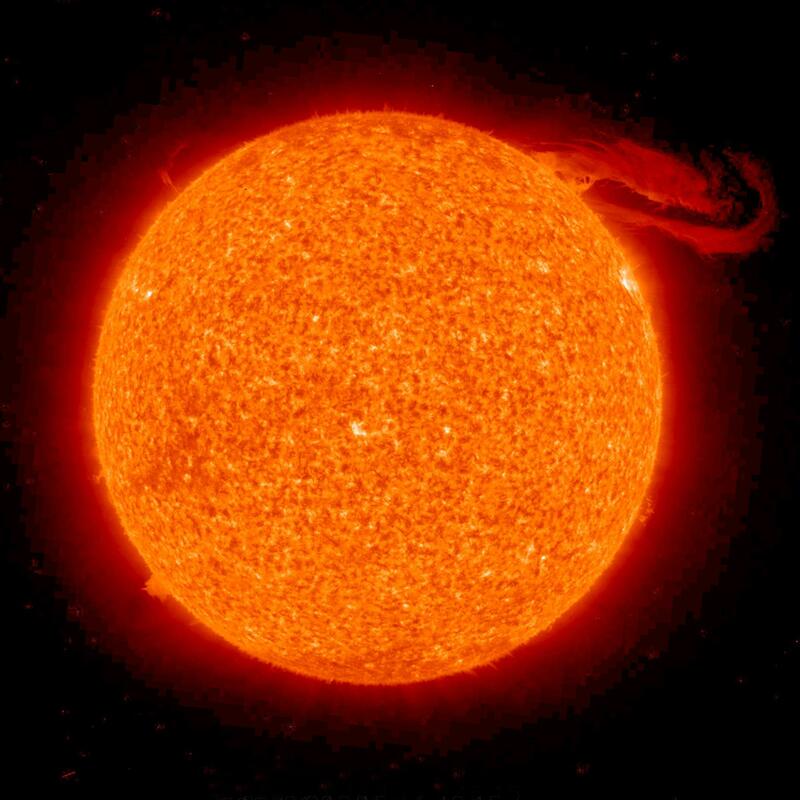 Prominences are relatively cool clouds of gas suspended above the sun and controlled by magnetic forces. This image, captured by the MODIS on the Terra satellite on October 2, 2008, shows an interesting phenomena called “internal waves”. These particular waves are northeast of Brazil, out in the deep waters of the Atlantic Ocean. They are highlighted by sunglint. Internal waves are waves that occur underwater at the boundary between layers of water with different densities. Like all major bodies of water, the Atlantic Ocean is composed of layers of water with different densities: the topmost is the least dense, while each successively deeper layer is denser. Internal waves are usually caused by the lower layer being forced against a shallow obstacle, such as a ridge, by tidal action. The ridge causes a disturbance, which creates a wave in the water layer, similar to the way that the wind can cause waves on the water’s surface. Unlike normal surface waves, internal waves can stretch for tens of kilometers in length and move throughout the ocean for several days. The Antares DLR-H2 flying test bed, jointly developed by the DLR Institute of Technical Thermodynamics (DLR-Institut für Technische Thermodynamik) and Lange Aviation GmbH, will complete its maiden flight before the end of the year. This artist’s impression shows the aircraft approaching Stuttgart Airport. NASA’s Spitzer Space Telescope captured the picture on the left of comet Holmes in March 2008, five months after the comet suddenly erupted and brightened a millionfold overnight. The contrast of the picture has been enhanced on the right to show the anatomy of the comet. Spitzer’s infrared picture at left reveals fine dust particles that make up the outer shell, or coma, of the comet. The nucleus of the comet is within the bright whitish spot in the center, while the yellow area shows solid particles that were blown from the comet in the explosion. The comet is headed away from the sun, which lies beyond the right-hand side of the picture. The contrast-enhanced picture on the right shows the comet’s outer shell, and strange filaments, or streamers, of dust. The streamers and shell are a yet another mystery surrounding comet Holmes. 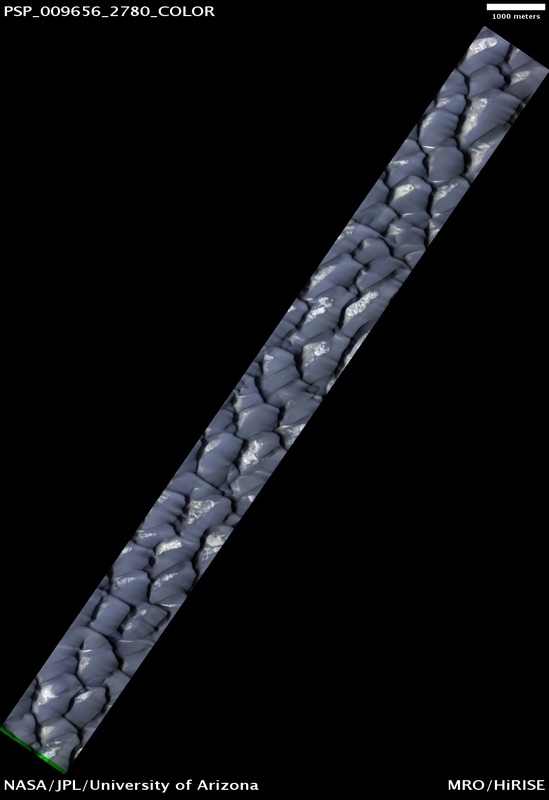 Scientists had initially suspected that the streamers were small dust particles ejected from fragments of the nucleus, or from hyerpactive jets on the nucleus, during the October 2007 explosion. If so, both the streamers and the shell should have shifted their orientation as the comet followed its orbit around the sun. 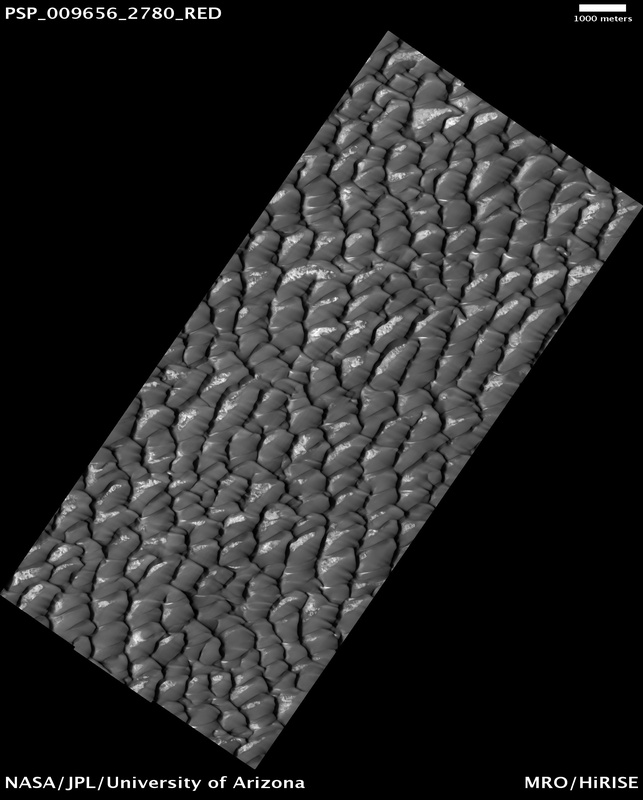 Radiation pressure from the sun should have swept the material back and away from it. But pictures of comet Holmes taken by Spitzer over time show the streamers and shell in the same configuration, and not pointing away from the sun. The observations have left astronomers stumped. The Spitzer picture was taken with the spacecraft’s multiband imaging photometer at an infrared wavelength of 24 microns. About three times a second, a 10,000-year-old stellar corpse sweeps a beam of gamma-rays toward Earth. Discovered by NASA’s Fermi Gamma-ray Space Telescope, the object, called a pulsar, is the first one known that only “blinks” in gamma rays. “This is the first example of a new class of pulsars that will give us fundamental insights into how these collapsed stars work,” said Stanford University’s Peter Michelson, principal investigator for Fermi’s Large Area Telescope in Palo Alto, Calif. 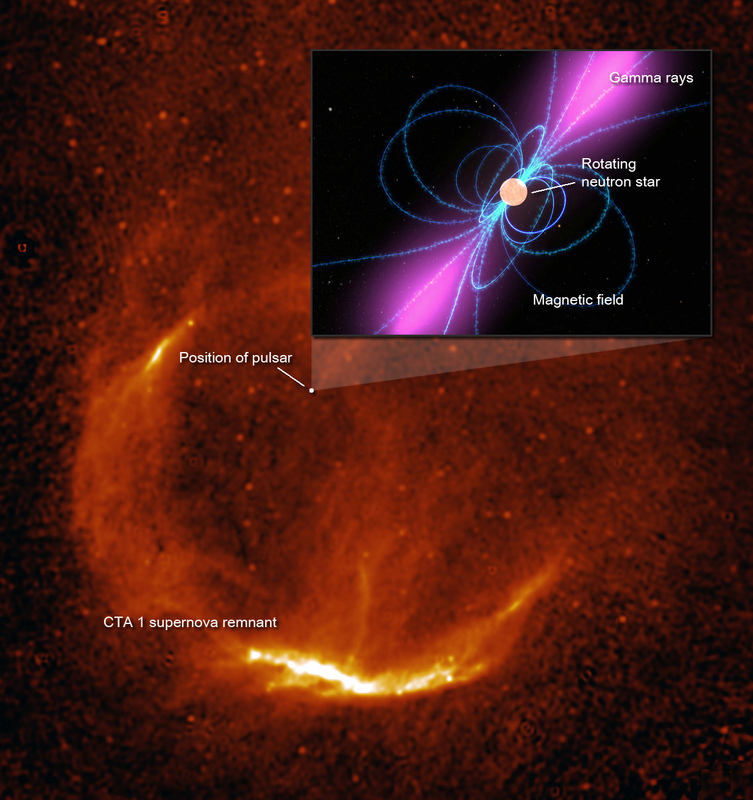 The gamma-ray-only pulsar lies within a supernova remnant known as CTA 1, which is located about 4,600 light-years away in the constellation Cepheus. Its lighthouse-like beam sweeps Earth’s way every 316.86 milliseconds. The pulsar, which formed about 10,000 years ago, emits 1,000 times the energy of our sun. A pulsar is a rapidly spinning neutron star, the crushed core left behind when a massive sun explodes. Astronomers have cataloged nearly 1,800 pulsars. Although most were found through their pulses at radio wavelengths, some of these objects also beam energy in other forms, including visible light and X-rays. However, the source in CTA 1 only pulses at gamma-ray energies. 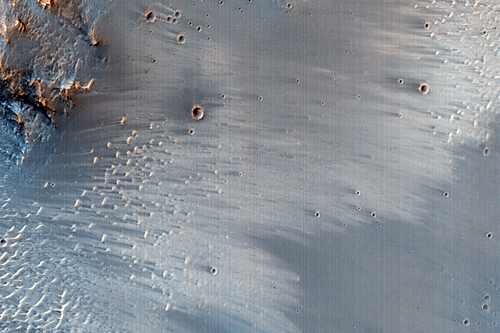 Scientists think CTA 1 is only the first of a large population of similar objects. “The Large Area Telescope provides us with a unique probe of the galaxy’s pulsar population, revealing objects we would not otherwise even know exist,” says Fermi project scientist Steve Ritz, also at Goddard. 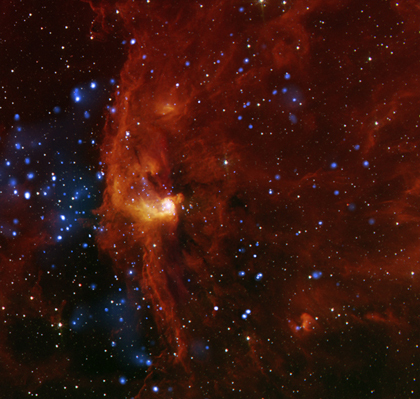 The pulsar in CTA 1 is not located at the center of the remnant’s expanding gaseous shell. Supernova explosions can be asymmetrical, often imparting a “kick” that sends the neutron star careening through space. Based on the remnant’s age and the pulsar’s distance from its center, astronomers believe the neutron star is moving at about a million miles per hour — a typical speed. Fermi’s Large Area Telescope scans the entire sky every three hours and detects photons with energies ranging from 20 million to more than 300 billion times the energy of visible light. The instrument sees about one gamma ray every minute from CTA 1, enough for scientists to piece together the neutron star’s pulsing behavior, its rotation period, and the rate at which it is slowing down. A pulsar’s beams arise because neutron stars possess intense magnetic fields and rotate rapidly. Charged particles stream outward from the star’s magnetic poles at nearly the speed of light to create the gamma-ray beams Fermi sees. Because the beams are powered by the neutron star’s rotation, they gradually slow the pulsar’s spin. In the case of CTA 1, the rotation period is increasing by about one second every 87,000 years. NASA’s Fermi Gamma-ray Space Telescope is an astrophysics and particle physics partnership, developed in collaboration with the U.S. Department of Energy, along with important contributions from academic institutions and partners in France, Germany, Italy, Japan, Sweden, and the U.S. The gravity of Prometheus alters the orbits of the fine, icy particles in Saturn’s F ring, creating dazzling structures like those seen here.Each of these diagonal features, called “streamer-channels” by ring scientists, represents a single close approach of Prometheus (86 kilometers, or 53 miles across) to the inner edge of the ring. This observation was optimized to show faint details in the F ring, leaving Prometheus (86 kilometers, or 53 miles across, at bottom) overexposed. The view looks toward the unilluminated side of the rings from about 15 degrees above the ringplane. 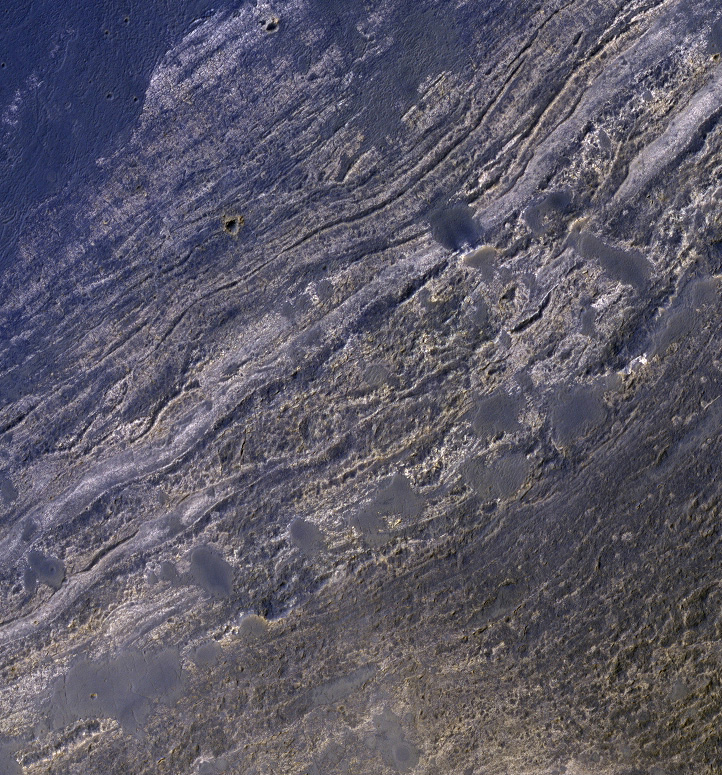 The image was taken in visible light with the Cassini spacecraft narrow-angle camera on Aug. 30, 2008. The view was obtained at a distance of approximately 1.2 million kilometers (751,000 miles) from Saturn. 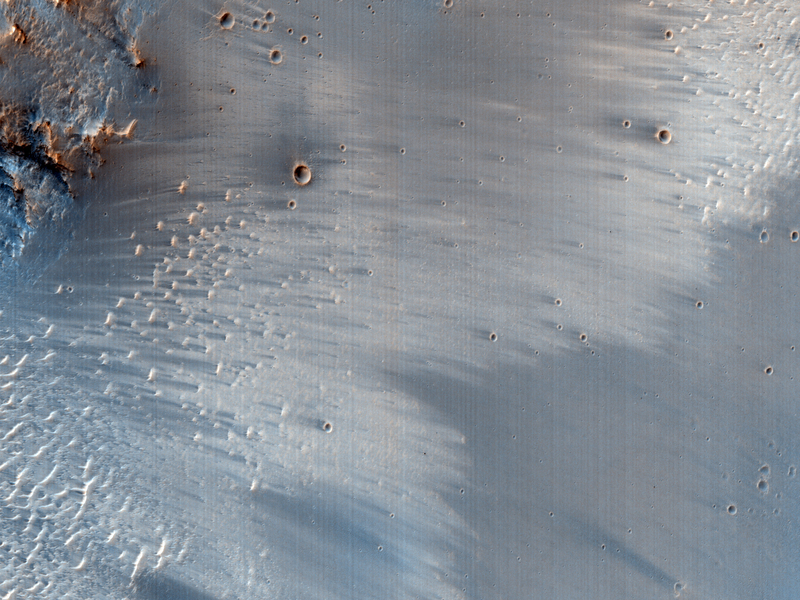 Image scale is 7 kilometers (4 miles) per pixel. For more information about the Cassini-Huygens mission visasit http://saturn.jpl.nasa.gov . The Cassini imaging team homepage is at http://ciclops.org . Gypsum is a common water-based mineral found in evaporative beds (ancient lakes or seas) on Earth. Gypsum rarely occurs in sand dunes on Earth as it is water-soluble (dissolves in water). However, gypsum can be trapped in basins that have no water outlets or receive very light precipitation and form beautiful dunes. The White Sands National Monument in the Tularosa Basin, New Mexico, is the largest gypsum dune field in the world. 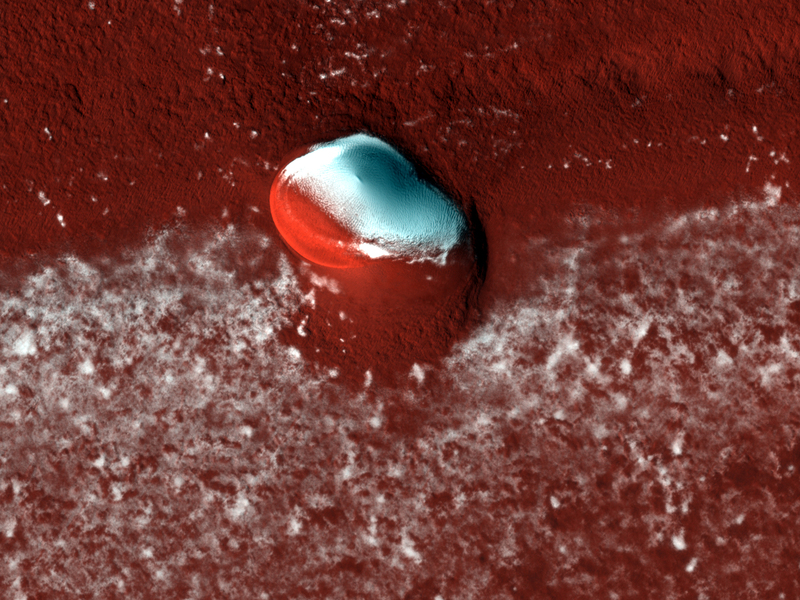 OMEGA, an instrument onboard the European Space Agency’s (ESA) Mars Express has detected gypsum deposits in the Martian north polar erg. Where did the gypsum come from? Scientists propose that gypsum deposits formed as a result of melting or retreating ice sheets in a polar evaporate basal unit. 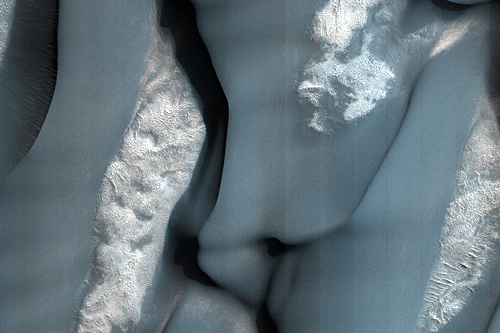 In this image, gypsum may originate from the bright bedrock and may mix with saltating dark sand. 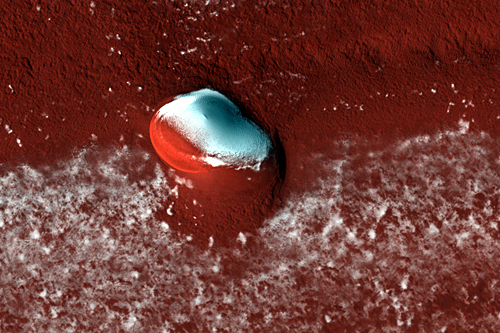 However, the true source of the gypsum is still debated among planetary scientists. 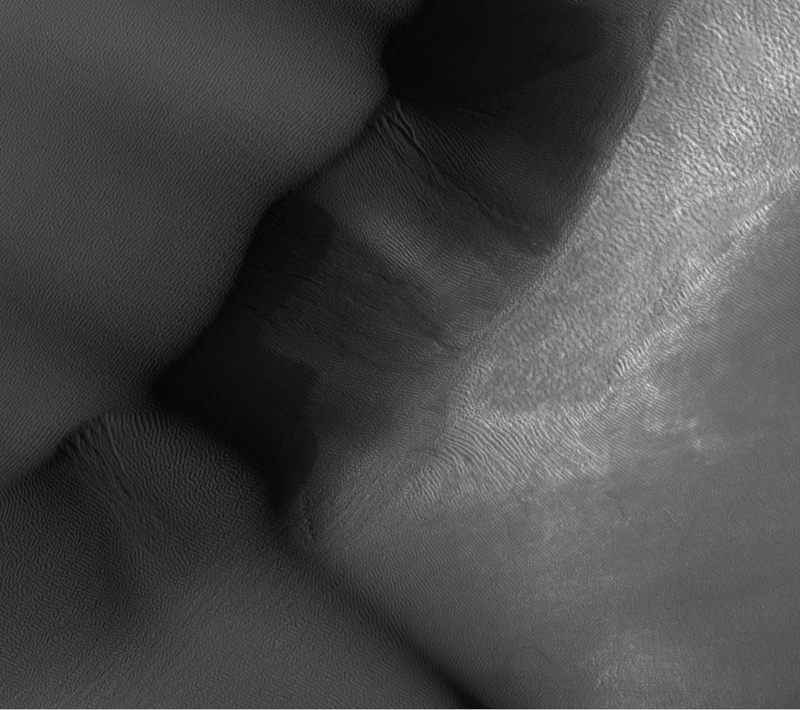 The mafic (basaltic) dark dunes are predominately transverse with transitioning linear and barchanoid dunes with the wind coming from changing west-northwest and west-southwest directions. 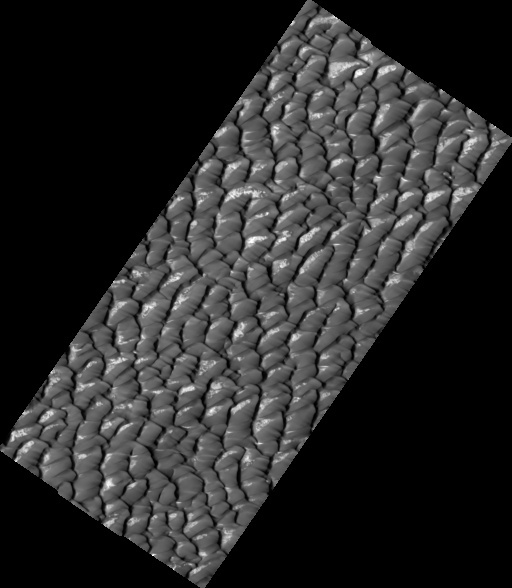 These dunes have several active processes occurring within them; grain avalanching is present at the crest of dunes and fading dark slope streaks are visible on the slipface.